20 years of operation in 2016, certified organic vegetables, fresh market and storage crops. Maple syrup, bedding plants, and grassfed beef as well. CSA's in Columbia County, Brooklyn, and Long Island City. 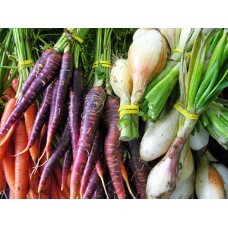 Wholesale, retail, and farmer's market in Hudson on Saturday's, 9-1 pm. Production Methods: Certified Organic. Grass-fed. Pasture-raised. Products: Lettuce, tomatoes of all types, arugula, potatoes, onions, carrots, broccoli, kales, Asian Greens, cabbages, garlic, sweet corn, strawberries and more!